American Kestrels are our smallest falcon – they’re about the size of a dove. You’ve likely seen them perching on utility lines where they search out insects and small prey for their dinner. But today they are declining in numbers due to habitat loss and the widespread use of insecticides which kill the insects and small critters that they need for survival. 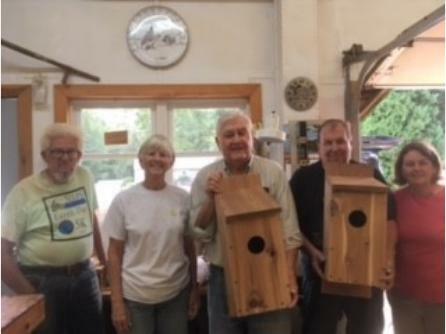 They are cavity nesters, and there is a group in SW Virginia that has undertaken a project to help these handsome birds by building and installing nest boxes made to the specifications that they need in the hopes of increasing their numbers. After one of that team spoke to the NN chapter about their work during a chapter program, the local chapter applied for and received a grant from the National Audubon Society to undertake a similar project in the Northern Neck. Lambeths in White Stone graciously provided a discount on the lumber needed for the box construction, then chapter members immediately set about making the boxes. To date, a total of 25 boxes have been constructed by the members. Pearl, in Kilmarnock, allows the chapter to store the boxes at their store, as they also do with the blue bird boxes the chapter builds, installs and sells around the area. To date, four boxes have been installed around the Northern Neck: one in Heathsville, one at Indian Creek Yacht and Country Club, one in Weems and one in White Stone. If you would be interested in hosting a box, please contact Melissa Gross. You can reach Melissa at melissagross@outlook.com. Dairy, cattle, and horse farms make excellent locations since their fields are not sprayed with insecticides because of the grazing by those animals. But any open fields that aren’t sprayed with insecticides are good candidates. Barns are excellent structures for mounting the boxes, but if you have the correct habitat, members can install the boxes on poles if there is no barn or other structure. In addition to contributing to the survival of this species, you get the added advantage of having natural insect control! One other plus is that these boxes also meet the specifications needed for Eastern Screech Owls, another of our bird friends whose numbers are in decline.